While being a prime player in the D and D2 segments with the Corolla and the Camry, respectively, Toyota has never tried its hands in the C segment. However, that is about to change with the upcoming Yaris sedan that made its Indian debut at Auto Expo 2018. The Toyota Yaris is expected to be launched in May 2017 and will go head to head with the Honda City, Hyundai Verna and the Maruti Suzuki Ciaz, among other sedans in the mid-size sedan segment. Let us see what the Toyota Yaris has in store for you. 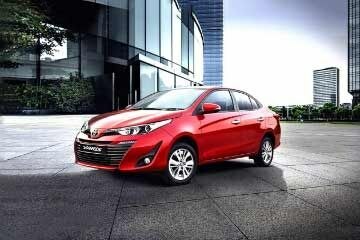 Trivia: The Yaris is also known as the Vios and the Yaris Ativ in Singapore and Thailand, respectively. Toyota chose to name it Yaris for the Indian market as it says this name has a more youthful appeal. The Yaris features a large air dam up front like the Camry. It comes standard with halogen projector headlamps with LED light guides, while the top-spec VX variant gets daytime running LEDs as well. These are placed at the extremities of the air dam. Though it is absolutely subjective, people might find the front fascia too busy in comparison to its rivals. While the front styling is in line with the Camry, the side differs from the more premium sedan thanks to the multiple character lines that run across the length of the Yaris. When it comes to dimensions, the Yaris, for some reason, appears smaller when viewed from the side, although it is only 15mm smaller than the City and the Verna. It is the same story at the front as well since it doesn’t seem that wide in the flesh, despite being wider than most of its rivals. You get a similar feeling on the inside too, but that’s because of its wheelbase, which is as much as 100mm shorter than the most spacious car here - the Ciaz. It rides on 15-inch alloy wheels, which are a size smaller than the ones offered in other sedans featured here. While the front and side profiles are not its forte in terms of design, the Yaris looks the best from the rear. The wraparound tail lamps with LED inserts work in its favour in making the rear profile striking. There are also two rear fog lamps that are housed in the bumper. The Yaris offers both front and rear parking sensors, the former is a segment-first feature. The cabin features dual-tone black-and-beige theme. The V variant gets faux wood inserts (check out the picture below), whereas the top-spec VX gets a relatively premium-looking glossy black inserts. Both variants get a gloss black treatment for the centre console. The steering wheel is derived from the Corolla Altis. A 7-inch touchscreen infotainment system is standard. However, both the variants offer different units. The top-spec VX gets the same unit as the Corolla and features Bluetooth phone integration, HDMI, MirrorLink and built-in navigation, among other connectivity solutions.Sadly, there’s no Android Auto or Apple CarPlay. The VX also comes with front and rear ambient lighting similar to the one offered as an optional accessory on the Ford Aspire. However, the sources for the rear lights are mounted on the B-pillar and is fairly visible. Hence, we think it could have been better integrated and hidden from the naked eye. Just to make the dash look soft-to-touch and premium, Toyota has incorporated fake stitching on the top section. However, in reality, the dash is made up of relatively hard plastic and quality is at par with other sedans in the segment, except the Honda City, which offers a soft-touch leatherette pad on the passenger side. Gets a twin-dial instrument cluster and a large 4.2-inch colour driver info screen which displays a host of information, including a segment-first tyre pressure monitoring system. The VX variant comes upholstered in beige leather, while the V gets fabric upholstery. The front seats are supportive and wide and even larger frames will feel comfortable. Further, the driver’s seat is 6-way power-adjustable, which is again a first in the segment. Like the Etios, it gets a flat rear floor. However, what will play a spoilsport is the rear legroom, which is way less than what the City or the Ciaz offers. Overall, the new Toyota is definitely not the most spacious sedan in its segment. Like its siblings, the Yaris too doesn’t feature any cost cutting measures when it comes to headrests. You get three individual headrests at the rear, which is something that’s lacking in most cars in various segments in the country. Also on offer at the rear are 3-point seatbelts for all three passengers and Isofix child seat mounts. In India, the Yaris gets an exclusive roof-mounted AC unit with digital controls and ambient lights similar to the unit seen on the Innova Crysta. Since people are not accustomed with roof mounted vents in a sedan, it will take some getting used to. There are two power outlets at the back of the central tunnel for rear passengers. The underside of the Yaris' bootlid features a thick cladding for better insulation. Thanks to cost saving measures adopted by other car manufacturers, the same cannot be said about the Yaris' rivals. The Yaris seven airbags as standard. Apart from that, Toyota also offers a tyre pressure monitoring system, front and rear parking sensors, vehicle stability control and hill-start assist, ABS (anti-lock brakes) with EBD (electronic brakeforce distribution) and brake assist, all-four disc brakes, among others. Takeaway: Where does the Yaris fit in? Toyota has been capitalising on strong brand loyalty built on the reliability of its cars for some time now and is leading the charge in the premium space with the Fortuner and the Innova Crysta. However, the automaker continues to struggle in the volume segments with the Etios range, which lacks the wow factor buyers demand. Toyota has learned a lesson with the Etios and has now loaded the Yaris with quite a few segment-first features, including seven airbags that are offered as standard across the range. What’s more, the Yaris’ build quality is more like the Corolla than the Etios. The latest Toyota sedan, then, seems ready to step in and bridge the gap between the Etios and the Corolla while giving its well-established rivals a run for their money. And with an array of standard features that even cars from a segment above lack, the base price of the Yaris is expected to be over Rs 10 lakh.